I mentioned on Riley's birthday that he is now 17 hands. Over the winter, I measured him at 16. 2 1/2 so he's grown quite a bit in a short period of time -- all wither. That may be why he has lost weight. His back has changed accordingly..
A new boarder at our barn works directly with a major saddler -- big name -- and the saddler Himself was at our barn Sunday morning with a full schedule -- three days of saddle fitting dawn to dusk, no stopping for lunch. I watched several saddle fittings, and was impressed by how thorough they were. I asked the coordinator if they could fit Ri and I in, and they did. How many saddle fitters does it take to change a light bulb -- er, fit a horse? They assessed several aspects of the shoulder (Riley's type is in bold). First is the the SHOULDER BLADE [sloped, normal, upright]. I have a pretty good idea what the shoulder blade constitutes, but here is some info I compiled for reference. The next measurement was SHOULDER HOLES [deep, medium, shallow]. It's unclear to me if this is a normal feature of the shoulder or if deep holes suggest atrophy. 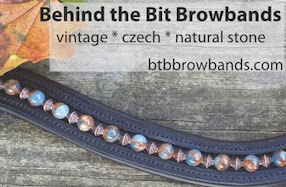 Some saddle-makers offer custom panels to fit deep shoulder pockets. Again, here is some info for reference. They checked for the presence of an UNEVEN SHOULDER [left forward, even, right forward], but I bet most of us have seen this. Interestingly, it seems that a big cause of uneven-ness is a club foot. Riley's left shoulder is clubby, making that shoulder weaker. Riley is skinny in some places and big in others. He does have big, lumpy, fat-covered shoulder muscles that (I think) make him hard to fit. 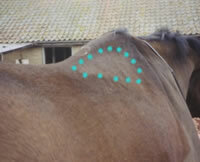 This saddle fitter rates shoulder muscle size [large, medium, small], and Riley had two of the three circled. 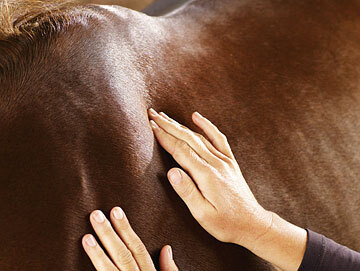 The national saddle center website is fascinating! Thanks for linking to it. Frustrating, to say the least, but perhaps this time you have found a fitter who can solve the issues. Wishing you and Riley the best. She's a middle-aged ex-broodmare. This puts her girth groove way forward because she has sprung ribs from carrying babies (her last one was really big). This, combined with the deep shoulder groove and high wither mean I have to find something that doesn't consistently slide forward into her shoulders and pinch them like a vise. This is starting to seem impossible. The person that designs an affordable saddle system that can TRULY adjust to the horse as he develops will be a gozillionaire. Engineers ... GO! Just to let you know, the scapula placement on your "shoulder blade and saddle position" link is incorrect in all the pictures except the first one. They have it too far back. 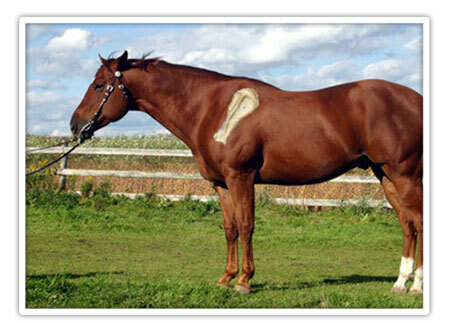 Here is a link that tells you how to "see" the shoulder blade on a live horse: http://www.rodnikkel.com/content/index.php/saddle-tree-blog-from-shop-and-desk/foreleg-of-the-horse-bones-and-attachment/ They also have a page talking about positioning a western saddle. http://www.rodnikkel.com/content/index.php/tree-and-saddle-fitting/proper-position-of-a-western-saddle/ At least the two agree that it should be behind the scapula!